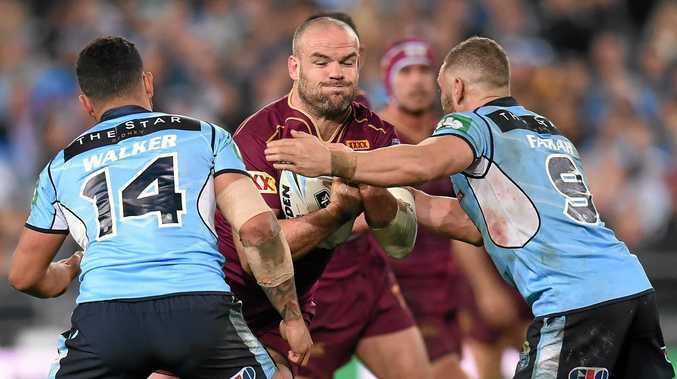 QUEENSLAND selectors will gladly hand Nate Myles what could possibly be his last maroon jumper if the rugged Manly forward proved he has overcome the knee injury which sidelined him for Origin II last month. Myles has been a wonderful performer for Queensland during its decade of dominance but at 31 years of age and with a body that is feeling the toll from more than 200 NRL games, 30 Origins and nine Tests, his representative days could be numbered. Queensland has the series locked away after winning the first two games 6-4 and 26-16 and is in a position to secure the state's first series' clean sweep since 2010. If Myles comes into the side he will replace injured North Queenslander Michael Morgan, who is sidelined with a posterior cruciate ligament injury. But if his knee is not up to the task, Queensland selectors could recall Manly's Daly Cherry-Evans who has played six Origins since 2013. Both states are set to reveal their Origin squads tomorrow with heavy speculation NSW will bow to enormous public pressure to name Wests Tigers fullback James Tedesco in the No.1 jumper ahead of Penrith's Matt Moylan who played fullback in the first two games. Blues coach Laurie Daly will be loathe to drop Moylan but the calls for Tedesco to be blooded are deafening. While he has adopted a pick-and-stick mentality in the past, Daley has made 11 changes since the embarrassing 52-6 hiding in game three in Brisbane last year. NSW skipper Paul Gallen will play his last Origin game in front of Sydney fans, bowing out as the Blues' most-capped Origin player in his 23rd game. He said while the pressure from critics, especially Phil Gould had been disappointing, he was ready to play his last game for NSW. "I'm happy to be finishing up," he said. "I spoke to teammates and management and asked them if they wanted me to play. "They all said there was a role for me to play and that was good enough for me." Gould's long-running feud with Gallen escalated after NSW Origin II loss with Gould labelling the Blues leadership as "selfish" and questioning the culture within the team. "It's disappointing but I can't stop Gus from saying what he thinks," said Gallen on Channel 9. "I'm not going to come out and say I am filthy. It's better to ask my coach and team-mates how they feel." Gallen will be hoping to deliver his response to Gould with a farewell win at ANZ Stadium on Wednesday week.